I'll admit it, when it comes to records sometimes I'm a bit of a judge-a-book-by-its-cover kind of guy. I don't mean to be, but there are times where I get a record in the mail, particularly one sent to me for review, and survey the landscape I tend to pretty much know that I'm not going to like it. When I opened up the package that this Eliot Pride 7" was in and took one look at the dude on the cover with his acoustic guitar, illuminated by the streetlights of a cold dark city, my expectations were set pretty low. I'm happy to say I was wrong. While I wouldn't go so far as to say I love this 7" and everyone should go buy it right away, it's significantly better than your average guy with a guitar release. 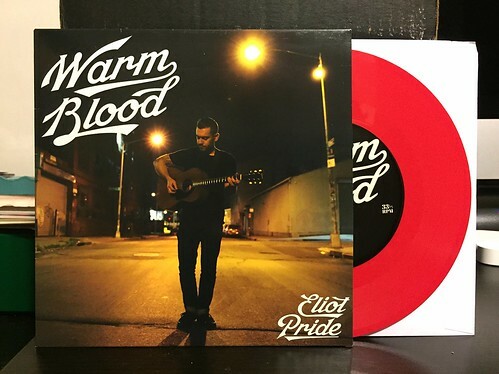 In particular, the title track "Warm Blood" is very strong. While it doesn't have quite as much of a breakneck, ramshackle sort of feel as Slim Cessna's Auto Club, I hear similarities between the two. There's a lot of country and alt-country that sounds forced and labored to me, "Warm Blood" has an authentic quality to it makes it far more memorable than most. The rest of the 7" isn't quite as strong. The other three tracks are mostly just Eliot Pride and his acoustic guitar with no backup band. Even these three are fine though. It's a good little record and if your tastes lean more towards the alt/punk/country/thing, you'll probably like it even more than I did.